This morning we went ashore and ran errands. Rock Sound was hit hard by Hurricane Sandy and many of the buildings on the main road look in need of repair. However, they looked the same when we were here three years ago, so it appears that the economy is depressed. 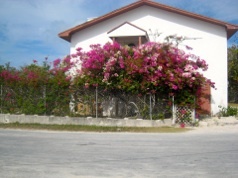 While the houses aren’t always in tip top condition, flowers apparently grow well here and many yards have large plantings like the one in the photo. There are quite a few small stores, some appealing to tourists, of which there aren’t many. Certainly there aren’t many boats here. Yesterday there were seven of us well spread out in the huge harbor and today two left and two more came in. Yesterday one of the sailboats that came in was another Lagoon 420, Island Cat. Sometimes it is hard to remember other cruisers names since we meet so many but this will be easy. Their names are Mark and Jan! Today we visited each other’s boats which is always interesting. We like to see what changes other owners have made and invariably we see something we want to do. Today we added a lot to the list. The most important was the bed. We have three queen size beds but they taper at the bottom to allow you to get into the beds using several steps. Mark on Island Cat, using the wood border already there at the foot of the bed, turned the border around and added more wood on the platform to make the bed rectangular. This enables us to have a regular mattress. They have a Sleep Number bed which is what we will get. That is a definite addition to the boat. They also built a large table for the cockpit with drop leaf sides. We can switch the large table in the salon with the lower coffee table in the cockpit, but it would be nice to have a large table in both places. Another very clever addition we saw was putting a switch on each LED light in the salon. We have three banks of lights and often you don’t want the six lights over the table or or the four lights by the galley, or the two over the sink. They also put an office in the companionway with some bookshelves, although not as many as we have. But they also have bookshelves in each of the cabins over the beds which we had planned to do. This morning I phoned our vet at Monterrey Animal Clinic in Stuart and explained that there is no vet here for six weeks but we might need another prescription for an antibiotic for Daisy in case her bladder infection returns. They told us to get Amoxicillin and gave us the dosage and directions. We walked to the Rock Sound Health Clinic and even though their rules for getting any medicine requires a prescription from a doctor, they listened to our problem and filled it for Daisy. I was pretty surprised. 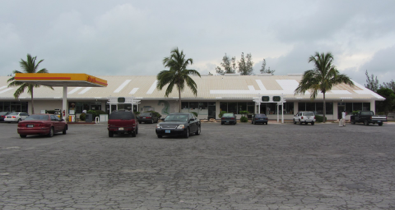 Our next stop was the grocery store which is on par with The Exuma Market in Georgetown. The store is actually affiliated with IGA. Prices here are about the same price we paid in Georgetown and much cheaper than what we paid in Staniel Cay. We will return to Florida with enough boxed and canned food in our plastic bins to last many more months, but it’s nice to replenish refrigerated items. Unfortunately their produce was getting old, but a new supply is coming in tomorrow afternoon, so we’ll go back. We’ll leave here on Saturday and our next stop going north will be Governor’s Harbor.